We are happy to introduce Neighbourgoods, our new product label. Neighbourgoods creates everyday objects inspired by the people and places close to home and close to heart. We start from the belief that the goods things in life are not distant and unattainable. Goodness, love, honesty, beauty... these are often just around us. Our hope is that everyone who holds, owns and uses a Neighbourgoods product will be reminded of this, and be cheered and inspired in their day. Look out for our first Neighbourgoods product! 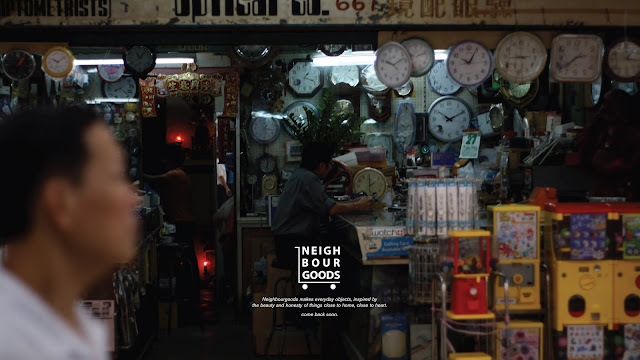 The Neighbourgoods logo is inspired by our experience buying a 40-inch LCD television from the neighbourhood electronic store that is 5 minutes' walk away from the studio. We borrowed the goods trolley from the friendly salesman Frankie. Frankie is a good neighbour.